Yes, says a voice from the Cretaceous age, but will there be a place for illustration in this strange new world you speak of? The problem with print is that it's evolved it's format so little over the years. Newspapers especially need to rethink the and re-purpose their strengths. Zimm, this is an exquisite post, thanks. I hadn't heard about Plastic Logic. We all need to wake up - and wake up fast - and think about how we can adjust our craft and business practices - to the new reality of where print is going. 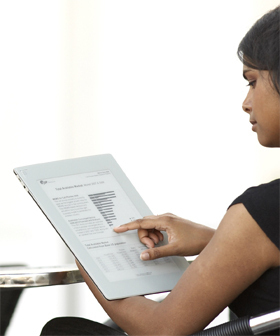 Recently when I was in NY I was having lunch with my editor on a book project and she was showing us the Sony reader. She LOVED it. It was a bit of a wake up call - here was a picture book editor, at a biz lunch about a print book, raving about this device. I must say that after I played around with it a little I understood it's appeal. In fact, it makes perfect sense, given where we are, that this is what's coming down the line. After the lunch I noticed a few folks on the subway whip out their readers and read away. Illustration will look fantastic on these devices. As a matter of fact, we may be able to do all sorts of new neat things, like animate or have a soundtrack to our images. It's a new day. Jeff Bezos was on Charlie Rose a few months back. He was talking about the Kindle of course, and how this time it's catching on in a huge way. He spoke of it as a boon to publishers since it makes more of the money profit and even allows the publisher to lower the price of a book. I sat at the edge of the seat waiting for Rose to ask the question I doubted he would...pictures? Finally he asked Jeff, "Why not color?" Bezos said that color is difficult and requires light. He said his readers do not like reading a lit screen for hours and the kindle is not really a lit screen. Also the battery for a lit screen has a much shorter life between charges. So, he said that he is still investigating it but they are not doing one in the near future. This means that images won't soon come to the kindle in color. When they do, the thing they will tout will be photos and illustration. Until then we have to watch readers move over to the Kindle and live quite well without covers on books. I am hoping Apple sees the potential as a content provider via iTunes. iBooks? Thin color reader that is wifi and can play music and see color magazines? Rolling Stone in color while listening to the Rolling Stones? I can see the commercial now. It isn't subsidized through advertising like print production and delivery so it may be recession proof. I still don't like it and you can't clean your brushes on it like old newspapers. Zimm, your posts look so elegant. Excellent article, Zimm. The profit model for digital content has been a sticking point for years, and it seems like very few publishers have been willing to blink first and start charging for the web version of their product. With the economic downturn and falling ad revenues, they need to make some bold decisions fast, or the print model that's supported their web forays will topple under the weight. I think illustration holds up well in this format, though it'll change some applications dramatically (covers will likely be judged against each other on digital "shelves" as thumbnails—a very different impact; spreads, too, won't fair well on these devices). It's a new world, but building a profit model that can sustain content providers—artists, writers, photographers; etc—is long overdue, and the only way to ensure that new information, not just recycled material, survives. Thanks for the great overview, Zimm. I'm sometimes the last one to embrace the tech versions of things, but find once I latch onto something, I can't live without it. I have a quite a good art library. I LOVE bookstores. I've always had several magazine subscriptions going. Now I use the internet more and more for art and news. 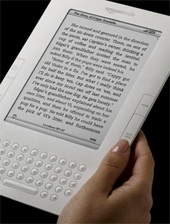 As to electronic color in books, more money is made long-term by phasing in innovations with a regular stream of upgraded versions, even if the technology exists to do it sooner. I've read about some of this technology before, but the real point of interest is the USA Today subscription note. Wow, that is interesting. I do welcome this post, and the positive tone of technology, and the references to print. Reading your article got me to finally download a book app from iTunes. For 99¢ I now own copies of 20 classic books with free upgrades to the collection to come. They are highly readable and at least one has illustrations. The light doesn't bother me and I'll bet they can improve on that. There were also graphic novels (Star Trek) to download. This, I think, is good news. Thanks, Zimm. This feels like an important topic to me, so please continue to keep those of us, who aren't as close to the cutting edge, informed. I still feel like many publications that use illustration in print aren't doing so in their web versions (Why?). I've always expected that this will change as online publications try to differentiate themselves from one another in their design and look, and want richer content. Your post helps to remind me that we're still very early into this technology. While its certainly positive to see people willing to pay for editorial content delivered via kindle, is that going to be enough to sustain these publications as we know them? 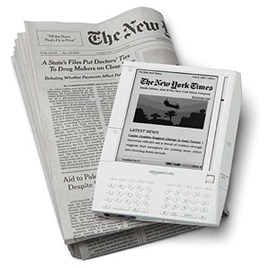 Newspapers generate around 70% of their revenue from advertising sales. I believe that the rates for the web are still way below print. Most traditional media cos. aren't set up like Google to sell thousands of small ads that display based on your search and IP address. I would guess that its only a matter of time before someone develops an ad blocker app for the kindle (they already exist as plug-ins for most web browsers) and similar devices, which would probably depress advertising prices more. Certainly, there are savings to be had by reducing the distribution of the printed product, but are they enough to off set the loss of ad revenue. While, I think this is certainly a step in the right direction I don' think it's necessarily enough by itself to save editorial alone. I think, ultimately, the answer will involve utilizing the new technology for short form journalism and breaking news while using the print for more long form, analytical and investigative reporting. If that were to happen there would certainly be no shortage if opportunities for artists and writers. Great post Zimm. This whole issue is a bit of an obssesion with me. As I write this we still don't know if there will be a Boston Globe tomorrow. The Globe's owner, the NY Times has given the Globe's unions until midnight tonight to make $20 million in cuts or the lights would go off. The thing that gets me is that we in the Boston area have had a month or so to digest the news and a lot of folks seem to be okay with the idea of no major (The Herald doesn't count) newspaper in Boston, especially after the failure of papers in Seattle and Denver. What we;re talking about is the paradigm shift equivalent to the Rockie Mountains suddenly falling into themselves and becoming...what? An ocean? A prarie? Nobody knows. What does appear to be certain is that the hardware has fallen behing the software, and I include the "software" of ideas as well. Same goes for transportation. The whole shebang is changing for good. We just need the right interface to take advantage of the rush of ideas that are coming our way. Oh, I still prefer a good old book. I'm glad to read this too... Eventually the need to distinguish digital offerings will bring on the color visuals, both static and dynamic. I think we just can't imagine all the ways that creative inventors will come up with to entice buyers / readers. I still lament the downsizing of vinyl album covers to CD jackets, but there have been some great creative uses of the smaller format. Of course, along came music downloads and CDs aren't selling much anymore. It does seem that formats emerge and die more quickly. But maybe this is only because digital is still so new (relatively) and things are shaking out. Perhaps when it matures and technology provides a certain minimum level, there will be a couple hundred years of a new flowering for creatives of all kinds... writers... painters... musicians... motion... actors... directors... dancers... there will be some amazing collaborations I'm certain. Thanks for that link, Michael. After reading it, it's clear that there is a lot still to figure out. I wonder what the advertising model will be. I think a big appeal of the kindle is it's similar size to a book and how it's buttons function like turning a page. The bigger screen device seems like more of a pain to haul around. The ePaper thing sounds ultimately better, could fold it up and stick it in your pocket!